Symone Abbott jumps for an attack. The senior outside hitter helped lead Northwestern to an undefeated weekend at the Duke Invitational. Northwestern’s senior centerpiece may finally have found her protege in a Midwestern freshman who was a major contributor as the Wildcats swept the Duke Invitational this weekend. Led by senior outside hitter Symone Abbott and freshman outside hitter Nia Robinson, the Cats (5-1) continued their hot streak to start the year. Abbott finished fourth in the conference last season with 3.96 kills per set, and kicked off this season with 3.9 kills per set in the opening tournament. 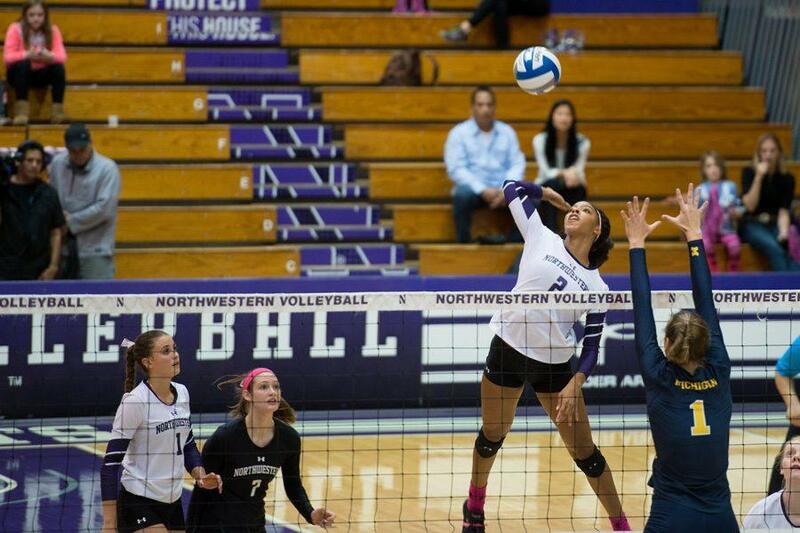 This weekend, Abbott moved up to 11th all-time on NU’s career kills list with 1,292. Though Robinson is young and untested in Big Ten play, Abbott said the freshman has so far taken the load off her and given opponents a second threat to prepare for when Abbott is off the net. Robinson anchors a relatively young Cats squad that features seven freshmen on its 18-player roster. Freshman libero Lexi Pitsas set a career-best with 14 digs against UNC-Wilmington, while freshmen Ivey Whalen and Amy Wang made their first career starts during the tournament. The Cats came out slow in their tournament opener against the Gamecocks. NU’s attackers committed eight errors and posted just a .083 hitting percentage in the first set. But NU rallied behind Abbott and Robinson in the following sets to come back and win 13-25, 25-18, 25-18, 25-19. Abbott led the Cats with 19 kills, followed closely by Robinson with 18. NU had a few hours to appreciate its comeback before regrouping to face Duke, which received votes in this week’s coaches poll. That match was the Cats’ closest look as to what to expect in conference play, where they will face eight teams currently ranked in the top 25. There are no ranked opponents in NU’s 2017 nonconference schedule. Against then-undefeated Duke (4-2), the Cats displayed their best hitting performance of the season. On 99 total attacks, NU only committed nine errors. The Blue Devils were ineffective against NU, which took a 25-21, 25-22, 25-22 sweep in a pristine offensive performance. Abbott and Robinson led the way with 15 kills apiece, and Hazen and freshman middle blocker Alana Walker followed suit with eight kills each. The Cats then breezed past UNC-Wilmington (3-3) 25-17, 25-10, 25-17 to sweep the tournament on Saturday with nine straight-set wins.